"Four ingredients are all Sally Geipel needs to bake up a batch of these lovely light-as-air muffins that make a sweet breakfast treat. 'They're my son's favorite and so simple to make,' says the Franklin, Wisconsin cook." Prepare cake batter according to package directions. 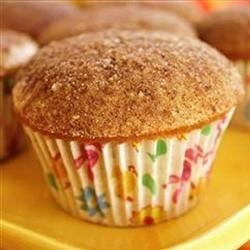 Fill 24 greased or paper-lined muffin cups two-thirds full. Bake at 350 degrees F for 20-25 minutes or until a toothpick comes out clean. Remove to wire racks. Cool for 5 minutes. Place butter in a shallow bowl. In another shallow bowl, combine sugar and cinnamon. Dip top of warm puffs in butter, then in cinnamon-sugar. Serve warm.